Microsoft has launched a free application on the dashboard titled Kinect PlayFit. 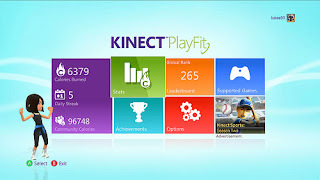 Playfit takes all of your stats from the various fitness and Kinect games and helps determine calories burned, while rewarding you for playtime and offers the chance to earn Kinect PlayFit Achievements, extra Gamerscore and Avatar Awards. The main goal is to reward players and encourage more healthy gaming habits. Download it today and start earning points!